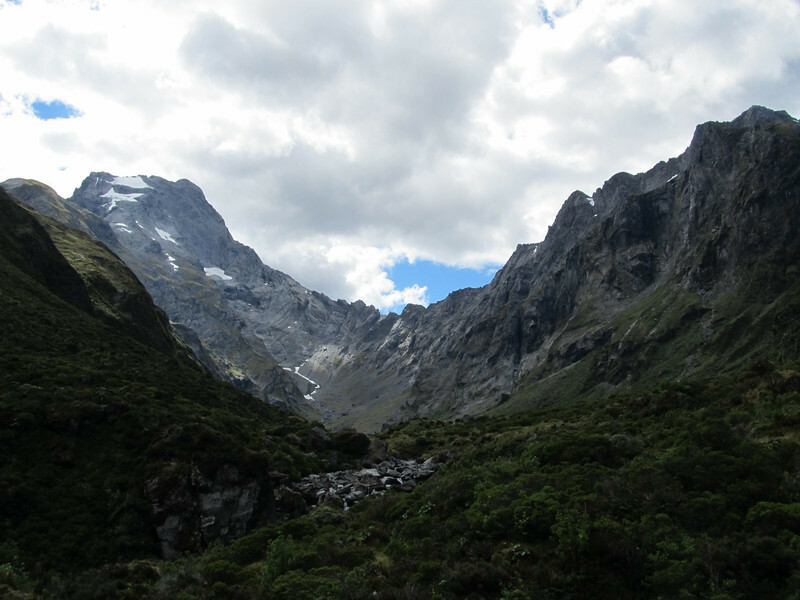 Awesome trip going from the Young Valley to the East Matukituki in five days including climbing Mt Awful. Day 1: Up the Young to Gillespie Pass (11h). Day 2: Climb of Mt Awful via South East ridge (12 h). Day 3: Gillespie Pass to Kerin Forks, where we said goodbye to Andrew and James, then we pushed on to Waterfall Flat. What a day (15h)! Day 4: We raced over Rabbit Pass while being chased by an incoming front and then walked all the way to Junction Flat (12h). Day 5: Leisurely 3 h walk out to Cameron Flat, from where we hitchhiked back to Dunedin. Team: Andrew Thornton, James Thornton, Kat Manno and Nina Dickerhof. Looking up the Young basin, Mt Awful on the left.